I've started to experience an issue with my middle mouse key (scroll wheel press) and selections. If I select a text, anywhere, it seems to put it into some sort of secondary clipboard without me having to do anything else but drag/select text. It's not the same as the clipboard, I can copy any text (ctrl+c) and keep that in my clipboard, select another text. If I then use ctrl+v to paste what I have copied, it's the text I specifically copied (ctrl+c), but if I click middle mouse key, it pastes the text I last selected. Why is this happening, and how do I turn the secondary clipboard off, so that it doesn't auto-copy when I select text? Usually, I'm using ubuntu at work and I'm afraid this one day will lead to accidents. Edit: I don't want to disable the middle mouse key. I only want Ubuntu to stop copying text without my action. Having stuff copied that I didn't explicitly tell Ubuntu to copy will lead to complications. Edit: This question is not a duplicate as it's about disabling the copy-on-select feature, not the actual paste feature. Pasting is totally unrelated, because pasting something that wasn't copied in the first place means nothing will be pasted in the first place. Copy-on-select is potentially a very dangerous behavior, as users with no intention of copying a text may not know that selecting a text copied it. With todays auto-save functionality in most document software its very likely an unintentional paste is performed when the intent is simply just to scroll a document, and any changes to documents are automatically persisted to a central storage / backup solution, with document revisions. Sensitive and/or confidential information could be at stake. Go to the "Keyboard and Mouse" section. 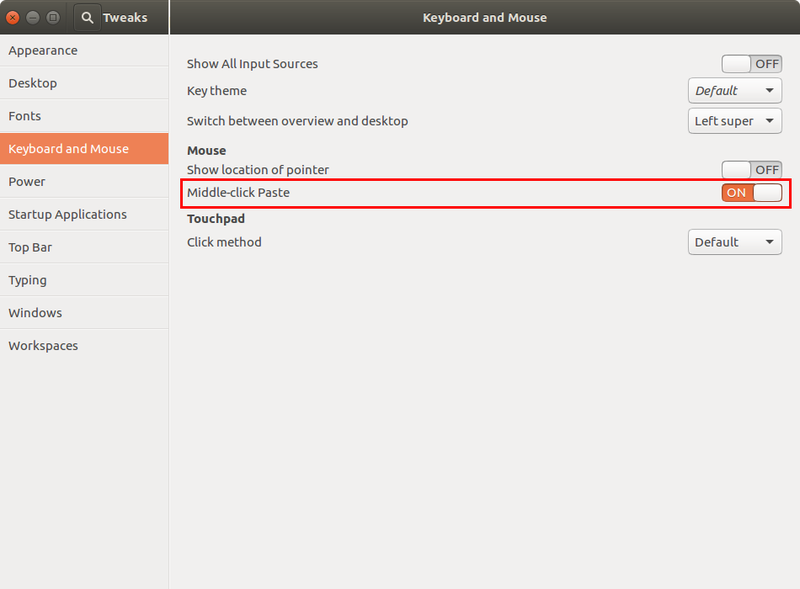 Toggle OFF the "Middle-click Paste" option. Not the answer you're looking for? Browse other questions tagged xorg clipboard copy or ask your own question. How do I disable middle mouse button click paste?